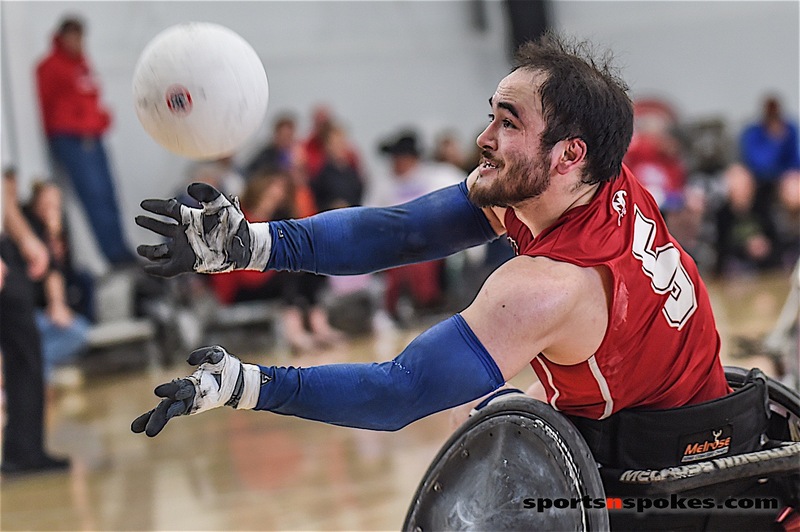 Daniel Romanchuk and Tatyana McFadden of the United States completed the first-ever American sweep of the wheelchair division at the 2019 United Airlines NYC Half on Sunday. 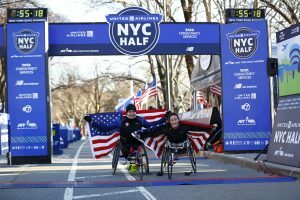 In the men’s wheelchair division, Daniel Romanchuk followed up his TCS New York City Marathon title with his first United Airlines NYC Half title, taking the tape in 51:35. “The races in New York are so well put together and it was a great race for me today. By the time we got toward the end of Flatbush Avenue there was a pack of three – Ernst van Dyk, Aaron Pike, and myself. Then at the small hill before Central Park, I decided I was going to break away and I was able to do so,” Romanchuk said. After winning the last four editions of the event, South Africa’s Ernst van Dyk took second place in 52:08, as American Aaron Pike clocked in just seconds behind to finish in third. 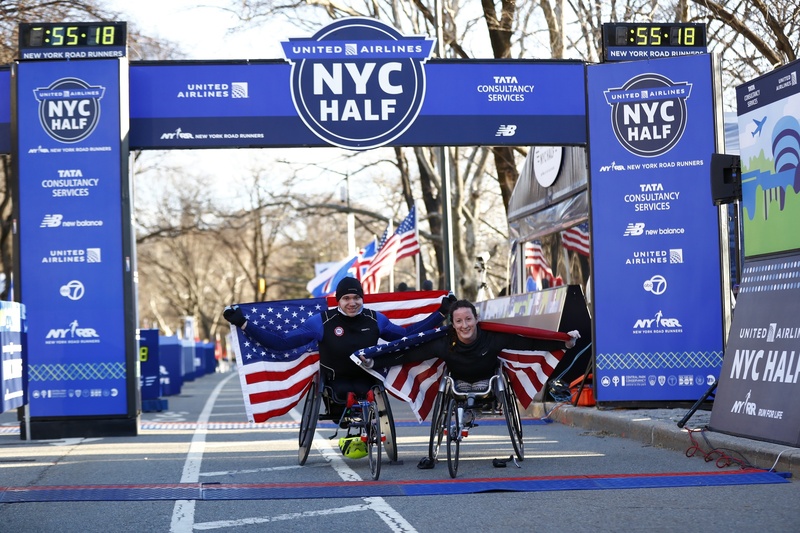 Daniel Romanchuk and Tatyana McFadden at the finish of the 2019 NYC Half Marathon. (Photo courtesy NYRR). McFadden, an NYRR Team for Kids Ambassador, won her second career United Airlines NYC Half title and first NYRR race since 2016 with a time of 57:18. “It’s been a while since I won this one. To be 100 percent fit for this and get in the front position early was great. I raced against some fierce competitors today, and to get back on top makes me feel stronger than ever,” McFadden said. Switzerland’s two-time defending TCS New York City Marathon champion Manuela Schär was unable to defend her title, finishing just behind McFadden in 57:27. American Susannah Scaroni recorded her fifth consecutive career podium finish in the event, taking third place in 58:51. The professional athlete field included nine Olympians and nine Paralympians who navigated the 13.1-mile course through neighborhoods in Brooklyn and Manhattan and past iconic New York City landmarks, including Grand Army Plaza, the United Nations, Grand Central Terminal, and Times Square. The United Airlines NYC Half is one of seven races – from the mile to the marathon – organized by New York Road Runners, which features invited professional athlete fields and makes up the NYRR Pro Racing Series. The NYRR Pro Racing Series also includes the NYRR Wanamaker Mile, UAE Healthy Kidney 10K, NYRR New York Mini 10K, New Balance 5th Avenue Mile, USATF 5K Championships, and the TCS New York City Marathon. In addition to the professional athletes and citizen runners who covered 13.1 miles, the 2019 United Airlines NYC Half hosted more than 1,000 youth runners in the Rising New York Road Runners at the United Airlines NYC Half on a 1200-meter out-and-back course on Seventh Avenue. Rising New York Road Runners is NYRR’s free, year-round youth program and events platform that serves nearly 250,000 youth across the country annually. New this year, those not running the race in person have been able to bring the race to their own neighborhood and run it virtually. The NYRR NYC Half–Virtual 13.1M allows runners to race anywhere in the world on their own time between March 14 and 17. Runners who complete the virtual race will receive one guaranteed, non-complimentary entry to the 2020 United Airlines NYC Half and a finisher medal. To learn more, visit www.nyrr.org. Click on any of the links below to read more articles from SportsnSpokes! Don’t Get Around Much Anymore? What is the Club Throw? 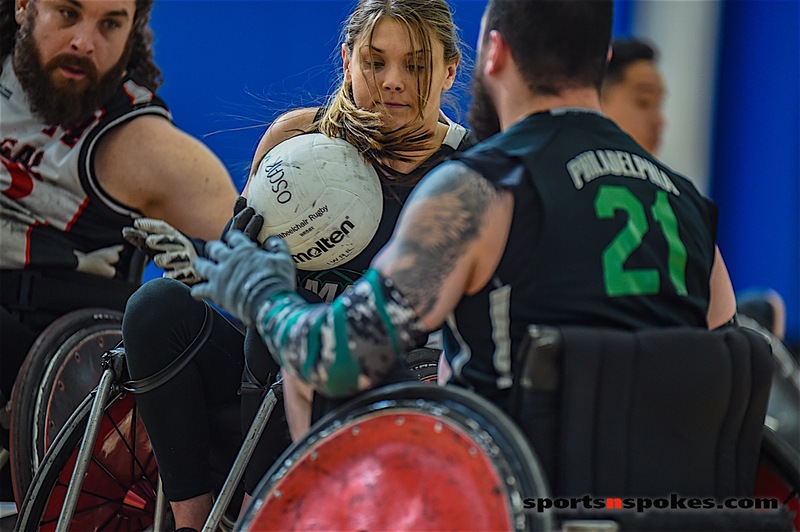 sportsnspokes.com is a sports and recreation online media source for people living with spinal cord injury and disease, spina bifida, MS and amputations. 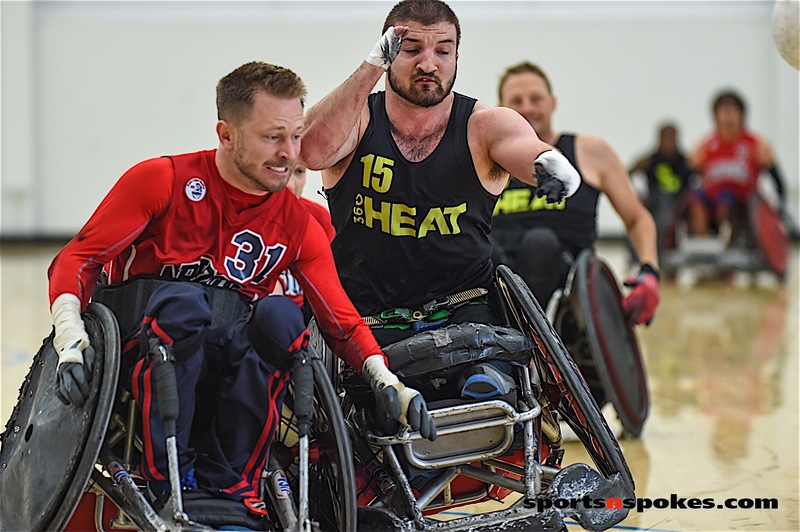 Our primary mission is reporting adaptive sports news, feature stories and recreation and lifestyle content through rich photos, video and compelling content. 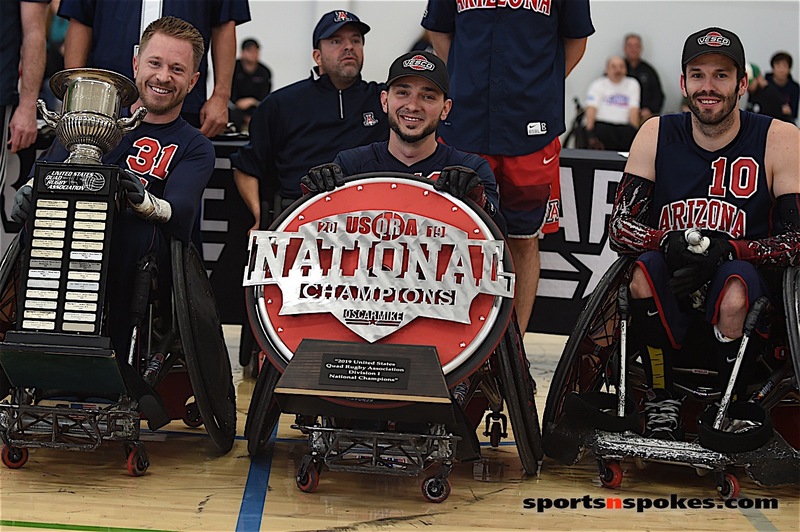 The U of A earned the title of D1 National Champions during the 2019 USQRA National Championships. (Photo by Loren Worthington).